Fancy shoes and casual jeans aren't exactly bedfellows--but they can look like a match made in heaven! From my perspective, the dressed up/dressed down tension can electrify an outfit. Take, for instance, the studded Jimmy Choo sandals, above, which crank up the frayed Levi's to cocktail-ready caliber. 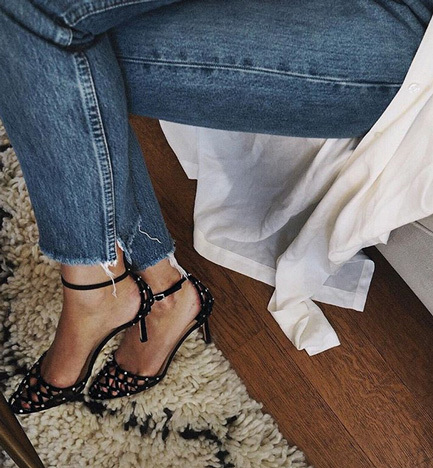 Credit the shoe's denim-complimenting attributes: discreet bling and caged edginess. More have-it-all heels that toe the fancy/casual line: this python and suede ankle-tie Alexandre Birman, this tassled Topshop, this strappy patent-leather Tabitha Simmons, this metallic Sophia Webster, and this embellished Gucci. Love these levi's! Which ones are they? I really like this combo cause it upgrades casual jeans and downgrades fancy shoes!